About a month ago, I had my birthday celebrations. Being 25 isn’t entirely fun. (yeah I’m 25. omg) It’s the time where people start judging how successful you are in your career, or how near it is you are in getting married or how many designer bags you’ve owned. Unfortunately, to be honest, I wouldn’t say I’m successful at all in my career. Maybe I should consider myself picky (ok to the worst, lazy). I start doing something and I’m actually good at it. Then suddenly alot of people start doing it too. (ok I’m not saying I’m the pioneer or I’m better than everyone else or that it was my idea, or being selfish) When it comes to this situation, I get a bit fussy over it and I change to do something else. Well, actually it is a very sensitive topic to talk about here (and a super long one) so I’d better not say so. I’d rather spill to people who are not in the utterly small, cake industry. Anywaysss … so since the first part wasn’t that good, people start asking “Eh got bf ar” “Eh you married edi ar” … Em… Sadly, I’d rather skip that part. because it’s a short and sweet answer, No .. I’d be worried if I start getting lotsa “red” cards, which I haven’t, so.. it’s okay. Haha why am I being long winded. It’s suppose to be about the birthday cake!! I wish I could tell people what kind of birthday cake and I get exactly that. Unfortunately, I’m not lucky in that area. I don’t usually get what I want. or what I asked for, when being asked. Then what’s the point of asking right. Anyway sensitive topic again. When I wrote the words “happy birthday” on top, I was actually a little reluctant. I wanted to write something funnier like .. “not again” or “unFML please” or “I’m awesome” .. But I guess I’d stick to the normal and get over it. Lol.. The cake, was rather interesting. I saw it on Masterchef Australia (season 2) as one of the Celebrity Chef challenge, and I knew immediately, I have to make it. It’s just weird, like I don’t really even fancy Snickers or Mars bar to begin with, but it’s just the little challenge that I wanted to take. It’s caramel and I don’t know if people are up for that level of sweetness, and it’s chocolate tempering (tears hair! I’ve not done in ages) But yeah it’s for me and I do whatever I want. It involves quite alot of components and some planning ahead is needed to avoid any swears and vulgarity in the kitchen. There’s a reason why it’s a challenge in Masterchef. I made half of the recipe except for the chantilly cream and chocolate plaque. God knows how many egg yolks and cream I’ve used. I’ve made caramel mousse before, not too sure if it qualifies as a parfait glace. I made it for my graduation cake in LCB. We were suppose to make a cake with the given ingredients like the basics butter sugar eggs cream rum, but no chocolate, only cocoa powder, gelatin, strawberries, almond meal and some other basic stuffs. Normally people would think of a strawberry cake or something but I don’t know what was in my head back then that I made a caramel mousse with Pâté à bombe. It was much simpler that this, Haha but I didn’t thought so back then.. 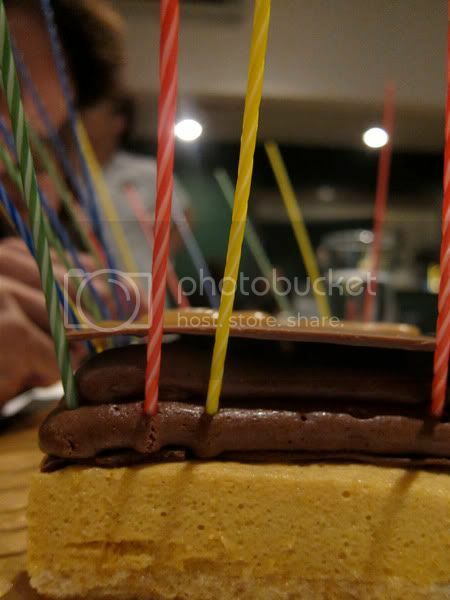 I remember it was a cake with almond joconde with caramel mousse and rum jelly with a chocolate glazing (made from cocoa powder instead) Sigh, so much has happened after that.. If you’re planning to make this cake, please read the recipe over and over and over again. OK now breath..it’s suppose to look like that if served individually. Step 1. Preheat oven to 180°C fan forced. Step 2. For the caramel mousse, whip 200ml of the thickened cream to soft peaks, cover and refrigerate until needed. Combine vanilla, remaining cream and 115g of the glucose in a saucepan and bring to the boil. Set aside. Meanwhile, weigh out 140g of the caster sugar. Heat a heavy-based saucepan over medium heat and add 1 teaspoon of caster sugar. Once it has dissolved, gradually add the remaining, stirring constantly, until it has dissolved and turned lightly golden. Slowly pour the hot cream into the caramel, whisking until combined; whisk in the butter followed by the gelatine leaves. Strain into a bowl, set over another bowl half filled with ice and water and leave to cool, whisking occasionally. Step 3. Combine the remaining 50g of caster sugar, 30ml water and remaining 20g of liquid glucose in a small saucepan over medium heat and bring to the boil. Meanwhile, using an electric mixer, beat the yolks on a moderate speed. Using a sugar thermometer bring the sugar syrup to 118°C. Remove from the heat and let the bubbles die down slightly. Pour the syrup down the side of the bowl onto the still whisking yolks. Turn up the speed and whisk until pale, doubled in size and cool. Step 4. To finish the mousse, fold the two cooled mixtures together, fold through the whipped cream then pour into a 20cm x 25cm x 3cm baking paper and place in the freezer until very firm. Step 5. For milk chocolate Chantilly cream, melt the chocolate and keep warm to the touch. Whip the cream to soft peaks. Quickly whisk half of warm chocolate into the cream, to lighten the mixture. Immediately whisk through remaining chocolate and refrigerate. *For the chocolate chantilly cream, I used 50% milk chocolate and 50% dark chocolate because I wanted it to set better as I’m not using any gelatin, and I piped on top of the whole cake instead of making quenelles. Step 6. For the peanut caramel, combine cream and glucose in a saucepan and bring to the boil. Set aside and keep warm. Heat a heavy-based saucepan over medium heat until 1 teaspoon of caster sugar dissolves when added. Gradually add the rest of the sugar and stir constantly until it has dissolved and has turned light golden brown. Slowly pour the hot cream into the caramel, whisking until combined; whisk in the butter. Set over another bowl half filled with ice and water and leave to cool until slightly thickened. Fold through the peanuts and the salt and refrigerate until needed. 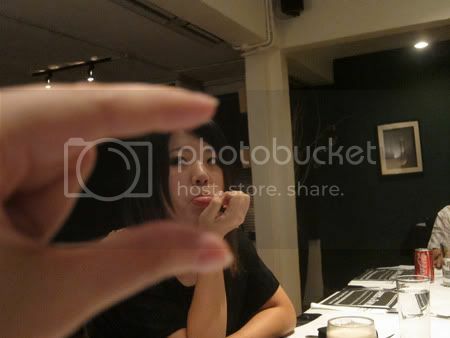 about 1cm. Bake for 8-10 minutes or until the dacquoise is crisp on top but slightly soft in the centre. Remove from the oven and slide onto a cool surface. Place a piece of baking paper on top of the surface of the dacquoise and carefully flip it over onto a small flat baking tray. Remove the paper. Allow to cool for 2-3 minutes. Remove the mousse from the freezer and invert onto the slightly warm dacquoise. Press down lightly to ensure the two surfaces are lightly stuck together. Remove the tin from the mousse. Slide onto a tray and return to the freezer. Step 8. For the chocolate plaques, gently melt the chocolate, no hotter than 45°C, in a metal bowl over hot but not boiling water. Pour 2/3 of the melted chocolate onto a cool, clean work surface and spread it around until it begins to thicken and feels cool to the touch. Return the cooler chocolate to the warm chocolate that remains in the bowl. Stir until completely combined. The chocolate needs to be about 26°C. The chocolate will feel cool on the side of your little finger. Spread the tempered chocolate with a palette knife over 3 x 4cm x 30cm strips of acetate plastic (stuck to the marble with sticky tape). When the chocolate is set to the touch but still slightly malleable, peel the strips off the bench and turn upside down so the chocolate surface is down. To portion the plaques, measure 10cm lengths, mark through the chocolate with a knife heated under warm water then cut the acetate with scissors. You will get 2 plaques per strip of plastic. Store plaques in the fridge until ready to use. * The sizes for this are for individual dessert pieces. I did mine in a bigger piece for a bigger cake, which wasn’t a very good idea because it was quite hard to cut into, unless you use a very hot knife. I followed overall the same concept but in different sizes. Use a thermometer. Step 9. Remove the tray from the freezer and peel off the paper and discard. Using a long knife heated under very hot water, cut the mousse into 10cm logs, taking care to keep the edges clean and straight. Step 10. 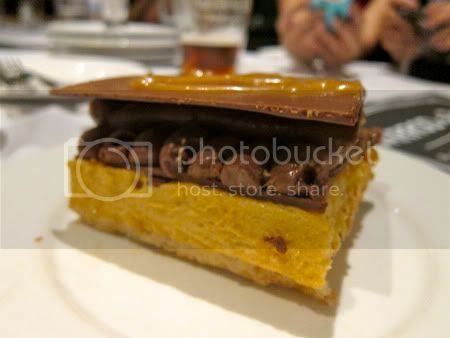 To serve, smear a small amount of the peanut caramel in the middle of the plate. This will stop the dessert from sliding around. Then place the bar on the plate dacquoise side down. Now peel the plastic off a plaque and carefully place, shiny side up, on top. Using a teaspoon dipped in hot water to form small quenelles and evenly place three on the plaque. Fill the two spaces with peanut caramel then place another plaque on top. Be careful not to get fingerprints on the chocolate. Serve immediately on a cool plate. I had some minor tweaks on the cake, like using gelatin powder instead of gelatin leaves. I used about 8g of gelatin powder for half the recipe (which was about 500g total weight) . I followed based on David Lebovitz‘s gelatin ratio. It’s really hard to convert gelatin sheet to gelatin powder as gelatin sheet all over the world may vary in size and weight. So I usually use about 7-8 grams of powdered gelatin to firmly set 2 cups of liquid, or softly set 3 cups of liquid. Then there’s no need to fuss over the conversion of gelatin sheet to powder. 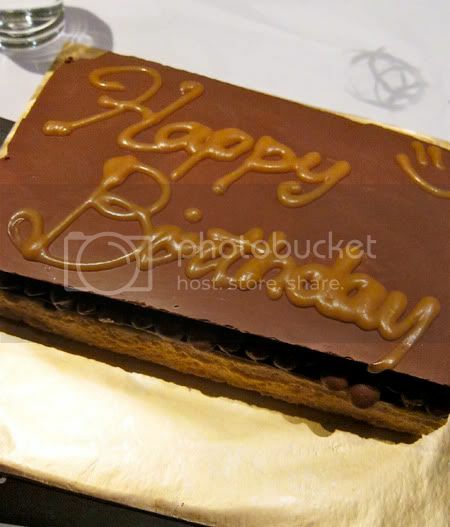 Now, the cake.. every thing was alright, just the fussy steps in making the caramel parfait glace that was a pain. The only thing I was quite worried about even before making the cake was tempering the chocolate. I haven’t tempered the chocolate for quite some time and I don’t have the slab to temper it by spreading and cooling the chocolate like it mentioned in the recipe. So I used iced bath instead and lotsa stirring. I had to do 3 times just to get the last one right. The first time, I overheated the chocolate in the first step. Then, the second time, I overheated the chocolate after cooling it down. The third time, I made sure the temperature was perfect. I knew it would set. So I just couldn’t be bothered to check. If it really didn’t work, I’ll figure it out later. The only problem I had was that I didn’t know how to put the candles, so I poked them into the parfait glace and it looked like it was going to go on fire, really. There’s no way to poke through the chocolate plaque. 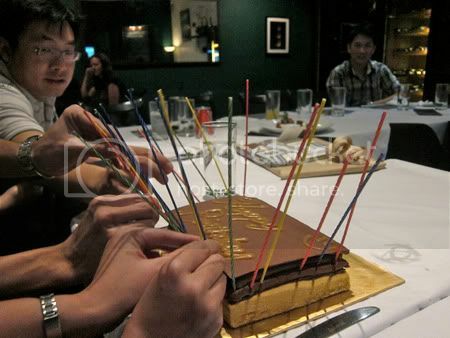 I should have made it smaller so we don’t need SO MANY HANDS to make sure the candles don’t tip over. Taste wise, it’s a bomb!! It’s like eating a snickers bar sans over-gooey-stickiness. The peanut caramel, milk chocolate, chocolate plaque, dacquoise, all came in well together. I probably would just put 1 plaque on top for a big cake like this, and not 2 plaques. But then, I’m not sure if I’m ever going to make this cake again. blimey i just took 1 hour 15 minutes to write this thing … goodness… !! Swee darling, I'm 25 too and no, I think no one should be given the right to bring another person down by their age. So what??? Hey, I'm happy but because I come from Malaysia and like you, I understand how horrible it is to have very nosy and busybody aunts asking shits all the time. I'm in Aussie because I couldn't *uck them. Let them be and stay cheerio and be happy!!!!! Happy belated birthday! The cake is amazing! You are very talented! I don't think I'll ever make a birthday cake for myself. Anyway, I've been 25, and yes, it's the time of crossroads. Perservere, do your best and better times will be waiting ahead. all the best! happy friday! Happy Belated Birthday, very pro cake! 25 is a very young age – that is so so long ago for me. I am trying to remember what I was doing when I was 25… I was 3 years into my first job and was about to be sent to Japan for a month long stint…No regrets but I definitely think I could have let my hair down more. And you know, even when you start to receive red cards, that is no reason for you to worry as well. There is a right time for everything -and it happens at different time for different people. Happy Belated Birthday Swee San!